Boy was I surprised when I realized everything else I had to do to keep my clients happy and keep myself sane. I couldn't just design - I needed to have a smooth client onboarding process, use a project management tool, master the art of Inbox Zero, streamline my project hand-off process and more. There's so much that comes with running a web or graphic design business! The key to running a profitable & enjoyable business that doesn't take over your life and drive you crazy? Organize your business as much as possible. Watch the video below or continue reading to learn how! This sounds a little obvious but it's usually the one area of business that most freelance designers overlook. When they think of organizing their business their mind goes straight to social media schedulers and editorial calendars. But streamlining your client process comes above ALL of those other things. Because a streamlined client process = impressed clients. And impressed clients = more referrals and repeat work! TAKE ACTION: Take 30 minutes today to write down your entire process, from initial inquiry right through to the moment you and your client part ways. Are there are holes in my process? Is anything missing? What could be removed to simplify the process? What steps could be combined to simplify the process? 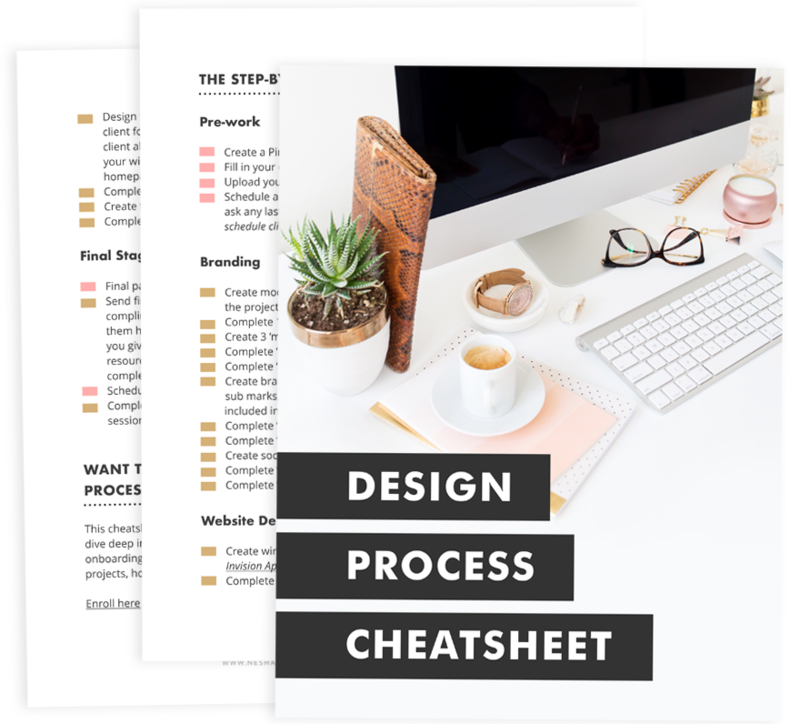 Download my FREE client onboarding checklist to help you document the exact steps you'll take when someone inquires about your services, and the free tools you can use to book them in your schedule. Most creatives are leaving thousands of dollars on the table. Because they're forgetting to follow up with their past clients and see if they need more work. Most of your clients will say yes and hire you again- but ONLY if you remember to follow up. Remembering on your own is impossible. You have to use a CRM (client relationship management) tool to either remind you or automate the process completely. You can use a free tool called Streak to accomplish this- a Gmail inbox add-on that can remind you to follow up with your clients. It's something I walk you through setting up in a module of my course, Organize & Automate. You can also use Dubsado to automate your follow up process. I teach you how to do this in a bonus inside Organize & Automate! Inbox management seems SO hard, right? It's like you try each day to get to Inbox Zero but there are already fifteen new messages waiting for you by the time you wake the next morning. Don't be that freelancer who resents looking at her inbox. I've been there and felt that; I remember a time when I would actually wince every time I got an email from a client. There are two solutions to inbox woes: you either get yourself a helpful plugin like Inbox for Gmail or you take the simple route and use Gmail's built-in features (such as labels, folders and stars) to get organized. Allowing you to look at attachments without opening the email. Allowing you to set reminders. When I started out as a freelancer, I managed all my clients through emails. We'd literally have about 300 emails across dozens of threads by the time their project was done. The client and I would BOTH be confused. It was difficult to find something my client said over a week ago and it was incredibly hard to organize their login info. Worst of all, it made me look unprofessional to my clients. If you want your clients to see you as the pro you are, you need to use a project management tool like Asana to organize your projects, files and communication. With PM tools, you and your client can store all communication, files, to-do lists, feedback and notes in one place. You can also create tasks for you and your clients to complete and set due dates for them! Want to learn exactly how to use Asana (the free tool pictured in the image above) with your clients? I have a free course that teaches you how! If you're anything like me, you screenshot a TON of stuff and just save them all your desktop thinking you'll be able to find them again one day. Then your desktop gets overloaded with files and your brain gets bamboozled. I have a system for my files now but a lot of business owners don't and that results in them forgetting where certain files are, taking forever to find them, and just feeling all-round disorganized. Taking time out once a month to organize your computer files will help you speed up your workflow big-time. Do you send your contract to your client and ask them to print it, sign it, scan it and send it back? And do you write out each and every line on all the invoices you create for your clients? You can use tools like Hellosign to send digital contracts and Wave Apps to send invoices. There's a lot of stuff involved in client onboarding. When I first became a freelance graphic designer, I just winged it. I didn't follow a process, I didn't use any project management tools and I didn't really know what I needed to get from my clients before beginning their project. This unorganized process led to my clients ALWAYS being late with the files I needed from them. It also resulted in most of my projects going way over their deadline. Streamlining your onboarding process is a part of Organize & Automate. You'll get a questionnaire you can send to your clients, a workbook of 11 email scripts you can use with your clients, and a process you can follow that will ensure your clients know what you need from them before starting their project AND give you those files on time. When people are told to outsource or hire an assistant, the 'I can't afford it’ line aaaaaalways pops up. It's something I said when I was told to outsource. I didn't think I could afford it so I totally dismissed the idea. But if you want to scale and grow your business, you HAVE to outsource. Even if it's just for 5 hours a month, having that extra pair of hands to handle tasks you don't want to do will save you lots of time, energy and money in the long-run. Client onboarding is a popular topic in the online world, but no one ever talks about client offboarding. Offboarding includes a lot of little tasks that you can automate and streamline, like asking for testimonials. Lastly, I want to talk about batching. All freelance designers should have batch days. A batch day is a day when you handle ONE task only. For example, I have batch days for blogging and creating video content. It's the best way of being productive and getting as much done as possible with the time you have because batch days allow your mind to focus on one task only instead of flitting from one thing to another and not getting much done - or not getting it done to the standard you want. * All links with an * next to them are affiliate links. But don’t worry, I only recommend products I use and love!